The article—titled “The Mystery and Occasional Poetry of, Uh, Filled Pauses”—is very well-written and engaging and I'm quite humbled to be featured in it. There is an image of science writers as being prone to making technical errors or exaggerating the claims of the researchers they interview. This was definitely NOT my experience in the present case. In fact, if there are any technical inaccuracies in the description of filled pause research, then these are due to a lack of clarity on my part during our chat. I'd like to address a couple of these as follows. In our discussion of filled pauses in Japanese, I explained that there are some speakers who fill their pauses with a vowel sound matching the last vowel sound they uttered. To illustrate how this might look in English, Dan put the following example in his article (where the underlined vowels are the target vowels which the filled pauses matches). We briefly discussed this exact example on our chat, but I should have corrected it because it suggests that there could be an intervening consonant between the filled pause and the vowel it copies. Because of Japanese syllable structure, this never happens. Japanese syllables end in a vowel (tofu, sushi) or a nasal coda consonant (shinkansen, Fuji-san). Therefore, the copied vowel sound is actually the last sound uttered, a vowel (or, in a few cases, a nasal consonant (nn-). Thus, an English example that would more precisely reflect what's happening in Japanese would be the following. "John wants to know ... oh ... whether the fee ... ee ... could be paid through ... oo ... other means." Another point that I should clarify stems from the following portion. 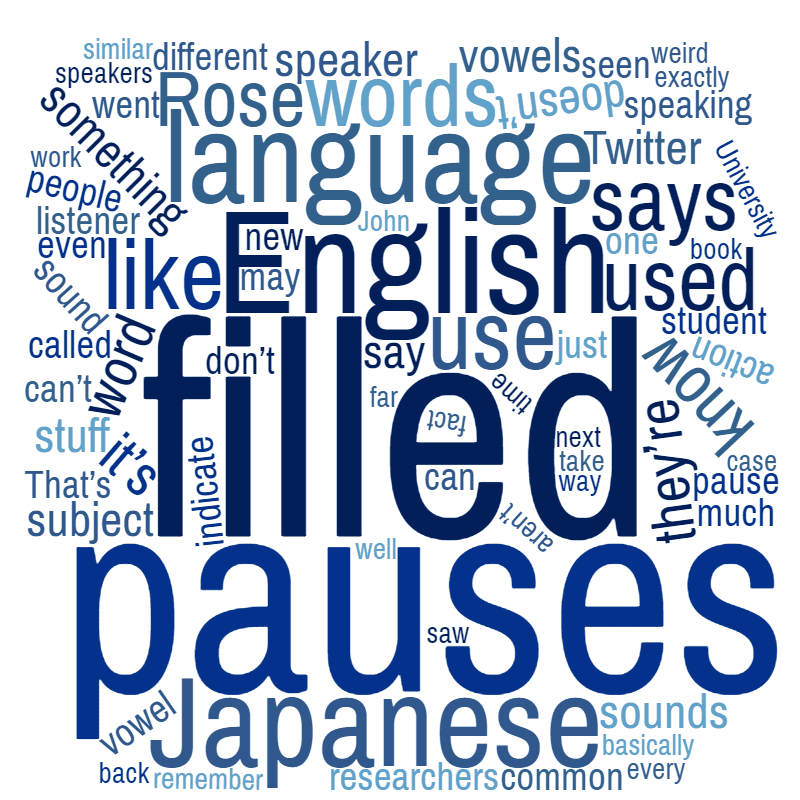 There is a wide and contentious debate about what a filled pause even is. Ralph Rose … says he tends to use different definitions based on whatever he’s studying at that moment. To the best of my memory, this is an accurate transcription of what I said in our chat. I think most researchers would understand what I mean, but I suppose others might take this to mean something like I change the definition of filled pauses to suit my needs (i.e., to get the conclusion I'm looking for). But what I meant is tied crucially to the first sentence. Because there are such diverse definitions of filled pauses across investigative fields, it is necessary to change one's operational definition in order to be comparable to an existing line of investigation. In acoustic phonetic studies, it's more common to limit filled pauses in English to only 'um' and 'uh'. But in sociolinguistic studies, one might wish to group them with discursive markers like 'like' and 'you know'. Finally, the following portion just made me blush. So apparently, I’m to be taken as a counter-argument to the filled-pause-as-(non)intelligence-measure claim (how about we call this the "umintelligent hypothesis"). I doubt I’m particularly persuasive in this role, but I can appreciate the elliptical writing effect here as much as anyone.